Safari dictionary – Learn the most important African Safari terms here! When you go on safari in Africa, it’s a good idea to have mastered some of the terms and slang you might come across along the way. But what is the actual definition of safari? What does it mean if an animal is nocturnal? And who are the Small Five? These expressions and many more are explained below in alphabetical order! Safari experiences from above, where you glide over the landscape in a hot air balloon. You can experience the bush and the wildlife in the magical morning rays of the sun in various locations in Africa, including Kenya, Tanzania and Namibia. A broad term for sparsely populated natural areas, where scrub and woodland are often found. A safari on two feet. You get right up close to your surroundings. The guide helps you understand what animals the sounds you can hear and the smells you can smell come from. If there are predators nearby, there is a guide who knows everything about the area, who is armed for added security. On a regular day safari, you will see diurnal animals. Diurnal refers to the animals that are active during the daytime. A safari by car. On a game drive, you will experience the magnificent African wildlife from front row seats. A game drive is usually a safari where you drive out in the morning or in the afternoon as this is when the animals are most active. A protected natural area inhabited by wild animals. The area is not subject to such strict regulations as national parks. The local people may, for example, be allowed to use the land for their cattle and live in the area. This is the case with the Masais, for example, in the Ngorongoro Reserve in Tanzania. Perhaps these words need no translation. A lot of people know them from Timon and Pumba in the Lion King at any rate. Nevertheless, “Hakuna matata” is Swahili and means take it easy in English. A tribe that lives in the northern part of Namibia. The Himba are noted for their red bodies and their thick dreadlocks coloured by a paste containing ochre. In places such as Serengeti in Tanzania, you will likely encounter a “kopje”. Out of the flat plain or savannah rises a mound consisting primarily of granite and gneiss. The scenic mound is also known as an inselberg and is pronounced “copy”. It’s a good place to look for wildlife, as kopjes attract animals. Cabins or the like in various sizes, often located at the national parks. In a lodge, you have everything you need, and which you would normally find at a hotel. Private room with a beautiful view, bathroom, restaurant and often a bar and a pool. Nomadic people living in Kenya and Tanzania. They live largely from the milk produced by their cattle that graze in the reserves. Their traditional dress is red and they live in round huts. Their daily meal is a mixture of cattle blood and milk and occasionally porridge. Are protected natural areas of natural beauty where fishing and hunting are prohibited. Areas with a national park stamp are protected by the state, which ensures that nature, flora and fauna are conserved. Visitors must adhere to the rules of the park when they are in the area. A safari after dark. Many of the savannah animals are particularly active at night (nocturnal), making it a great time to go on safari. A term for animals that are active at night. If you go on a night game drive, there’s a good chance of spotting nocturnal animals. A security guard who protects the parks. Besides guarding the parks, rangers also keep an eye on the bush and help if anyone needs assistance. Means “to travel” in the African language Swahili. 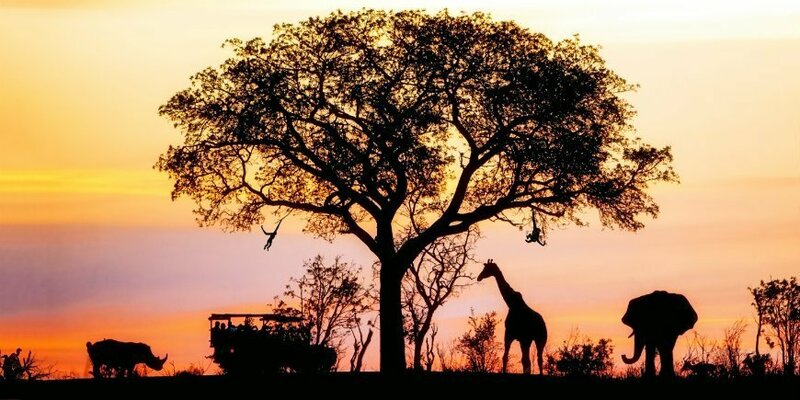 In travel industry language, safari means seeing animals on the African savannah. Besides being a wonderful experience, safari is also a beer from Tanzania. A grassy plain with scattered trees and bushes. It alternates between dry season and rainy season, and the lushness of the savannah alternates as well. A safari where you drive the car. The self-drive experience gives you the freedom to see the sights without having to wait for others, or to stay a little longer. A drink at sunset. A sundowner is a perfect end to a long, exciting day. A safari after dark. It is a very special experience when it is possible to see the many nocturnal animals on the savannah. The elephant, the buffalo, the leopard, the rhino and the lion. The Big Five is an ancient hunting term for the five animals that were the hardest and most dangerous to bring down. Also known as the great wildebeest migration, is a fascinating experience. Every year, some two million animals migrate between Serengeti in Tanzania and Masai Mara in Kenya. The herd consists primarily of wildebeest, but gazelles and zebras also join them. Are one of Africa’s oldest cultures. The San people, also known as Bushmen, originate from southern Africa and have been hunter-gatherers from time immemorial. The San people are bush people, and several of them live under difficult conditions today. The elephant shrew, the red-billed buffalo weaver, the rhinoceros beetle, the leopard tortoise and the ant lion go under the name, the Small Five. Behind the word tusker is an animal: the elephant. African elephants are traditionally referred to as “tuskers” when their tusks grow so long they reach the ground. Besides being a nickname, Tusker is also a Kenyan beer. A porridge made of maize or cassava, which comes from the manioc plant. The porridge is served with fish, meat or vegetables. Sooner or later on your safari, you will likely come across an ugali – at least if you are travelling to one of the East African countries such as Tanzania. A safari on foot, just like the bush walk. The safari takes around an hour when a guide shows you the savannah and its animals. On the tour, you may be lucky enough to see zebras, elephants and buffaloes, and you are accompanied by an armed guard for security reasons. A tent camp situated in a natural area. The tents are tall enough for you to stand upright. They have floors and even a toilet and shower. You can get up and go to bed with the wild animals, which is an amazing experience. And you will be staying right on the threshold of the national parks.